DIY Hell..S.... EQ? Phaeton Son Of Hellios! FIRE!! !Let's do it! Sooo....I will have some time this weekend to start PCB design. Need some input from you, lady's and gents. if someone can put lite on this? and will reduce headache caused copy-paste-righters....etc. Insert after micpre? Line input option? Your input wellcome. I think this can be really nice project. Ah, yes....just a thought....Lunchbox format card wit EQ only? Re: DIY Helios EQ? Let's do it! I think this might be a little too contentious. Helios gear IS in current production, and Tony Arnold (in Europe) is known to visit forums such as this and voice his opinions. If a version was attempted, I'd suggest some considerable changes and a COMPLETE avoidance of the term 'Helios'. It is a registered trademark and will bring down quite a lot of trouble, I've little doubt. Re: DIY Hell-I-OS EQ? Let's do it! Would love to have a couple of these guys. An Olympic studio Helios opened up. It can be good to know material and core size for LF inductor. LOL, I'm very interested. I've got a pcb layout for those amp cards and two sowter lustraphone copies waiting to be used. i even bought a small coil winding machine and i was just about to order some formers and core to try winding that low freq inductor. Ditch the mic pre. Keep the switches and pots. It's not like that mic input stage/transformer has anything to do with the sound of these modules. What value is the LF-inductor? i simulated the schematic a few months back with the values from various schematics and i got a value of 10H (this was confirmed in one of the posts here IIRC). I can't run the sim right now coz i'm at work so i don't know what the value is for the mid-band. But IIRC the mid-band inductor got varied in quite a few versions so there's no telling what the actual values were but i remember the values for the 2 tap inductor in one of the versions was more or less correct but i was planning on winding an inductor with more than 2 taps to match the values of the styroflex i have lying around. for people that want more info i suggest searching the B-B-B-Big helios picture thread on Pro Sound Web. 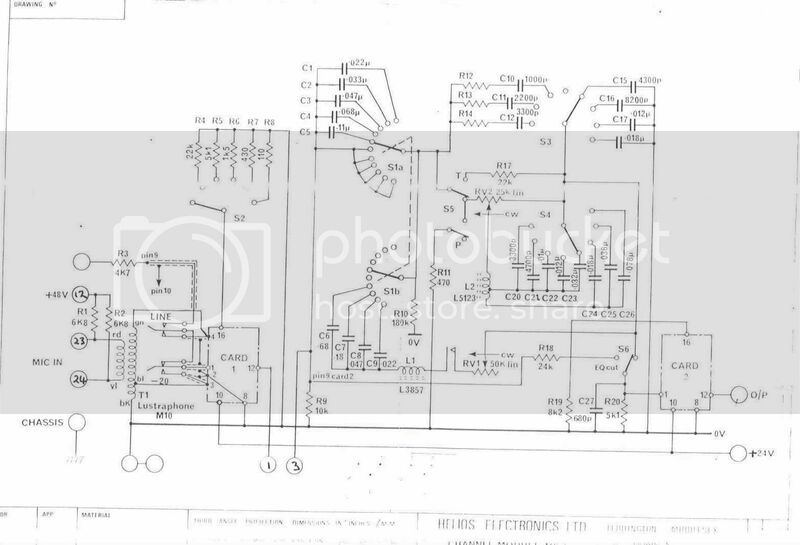 I'm still looking for the schematic that was posted on vintageking for the 2004 helios reissue, i found the first page, but if anyone has the other 2 pages could they be so kind and email it to sureshotstudio -AT- gmail -dot- com . Yap. Every additional info wellcome. Hmm. I agree about the name and i don't think the schematic should be posted. But, there are many in-production projects going on here. What's different about this? Why can't Igor do a H*** type? Others do other type's? The only reason there would be a problem is if TA had a fit (uh oh, being such a small project and totally modified) and that would be a real downer.. Sheesh. Besides, this would be a great addition to the 51x release! I think Tony should helping us out!? He can have some champagne too? I am in, depend on how much those inductors are going to cost, i was waiting for someone to do this. In case you wound inductors youself, $20 max for pair. In case someone else do it....$40-50 maximum for pair of inductors. I'm in for a pair! and waiting for oppinions etc. Christmas present for my son? Is there some kind of coating that acrylic/enamel paints son't stick to?